What does it mean to lead like a woman? With the public eye on this historic election, new women’s conferences popping up across the globe, and membership in women’s organizations on the rise, a different answer to this question seems to be on the tip of every thought leader’s tongue. I’d like to start with what it isn’t. When I was 24 years old I was offered what I thought would be my dream job. I was living and working in China as part of the Princeton in Asian international teacher program. I was midway through a transition that would eventually take me from a career in academic research to making a difference in the lives of leaders in the corporate world. Having thrown my hat in for a role that was a long shot, I received word from my mentor that the risk had paid off. A large, global organization was offering me a position to serve as a cultural awareness advisor and communication coach for one of their top executives in Shanghai. I was over the moon. There was just one problem. By the time the offer came in, the cracks in my perfect plan had started to show – cracks that would eventually shatter my dreams, and take me back to ground zero. I had worked SO hard and undergone SO much strain getting to that point that I was on the verge of burnout. A mental breakdown and major illness would send me careening into a five-month crash that re-wrote my story. It took me the next few years to fully recover. I share this story at the risk of casting myself as anything BUT a woman who has something to teach about leadership. But I’ve also seen in my now 10 years of coaching women leaders that these kinds of moments are INDEED the way the glass ceiling looks in many of our lives. Of course, not every woman’s journey looks the same. Some of us face big breakdowns like mine. For others, a series of small events add up to a lack of traction in the long run. But the vast majority of women have a tale to tell about a time when their momentum came to a crashing halt. The problem isn’t just that it happens. The bigger problem is that we see these crash and burn moments as normal. In fact, many of us wear our physical, mental and emotional rupture as a badge of honor. We have learned from the dominant culture that the definition of success is working harder to get more done. And, while I can’t deny that many women I support have made it to the top in this way, it is taking a toll on our bodies, our souls and our communities. What’s more, it doesn’t work. According to the McKinsey 2015 Women in the Workplace study, over 70% of the women who “make it” to the C-Suite are NOT happy when they finally get there. The burnout approach to success is an epidemic. I have yet to meet an industry or profession that has fully risen above it’s grip. two years ago I attended the University of Pennsylvania to complete my Masters’ degree in the field of Positive Psychology. We studied resilience. We deconstructed hope. We learned about the power of optimism and the driving factors of community well-being. I am beyond proud to name this elite school as my alma mater. The students that come out of the MAPP program are bold. Brilliant. And they are wildly committed to furthering the mission of greater well-being on the planet. Yet, many of them are also depleted, exhausted and on the verge of burnout by the end of the school year. The cost is high, and it plays out in every industry, from medicine to finance. Statistics show that loss of productivity due to sleep deprivation alone costs US business 6.3 BILLION dollars per year. Yet we continue to preach health while simultaneously running ourselves into the ground. As a woman who feels the pain of these outrageous truths in my own body, I want to call a spade a spade. If the happiest students on earth are still scraping themselves off the floor at the end of the day, the problem is bigger and more embedded than we think. The truth glares at us in the face when we look in the mirror with bags under our eyes. We have NOT figured this out. I believe that to truly lead like a woman means taking these costs seriously and taking a stand for something different. Success at the expense of our health – body, mind and spirit – has led to depletion that wreaks havoc on our homes and destroys our capacity to authentically fight the good fight at work. We are depleting ourselves. We are depleting our employees. We are depleting our planet. And we need to stop. I wish I could claim to have all of the answers. What I do know is that a change will begin with ONE leader at a time. Huffington is a great example. She recently turned her attention to transforming the culture of burnout in major corporations through the new ThriveGlobal project. And when a woman with power is serious about her cause, let me tell you, the world begins to listen. I am writing this piece, frankly, as a call to action. On the political front, we are currently witnessing history in the making. We are seeing the first woman claim rights to the white house, with an intention to lead. We can make sideways jokes about her strong, masculine presence…. or we can do the work it takes inside of each of us to actually unearth our own truths about what it really does mean to lead like a woman. What priorities would we change, if only we could trust that doing so “would work” for ourselves, our employees and the bottom line. What truths would we tell? I believe that to truly lead like a woman one MUST practice exquisite self-care – must put our own air mask on first before helping others. I believe that this is the ONLY way that those of us who DO hold the vision for a thriving future can ACTUALLY bring this vision forward. I believe that the greatest power we have as women is our power to INSIST on feeling good – right here and right now. Not to chase pleasure, but rather to use the cues from our bodies and our intuition to course correct on a daily basis. If something is off – in our emotional balance, in our households, or in the boardroom – to take the risk to speak up, and to do the hard work to right it, rather than sweeping it under the rug. I believe that as women, our resentment and our resignation are killing us – literally eating us alive from the inside out. These feelings are poisoning our bodies, destroying our health and damaging our relationships with the people around us who we claim to love. I believe we must stop feeding these wolves – instead daring to be the starting point of the change we wish to see. I believe that leading like a woman means taking one step at a time in the direction of that knowing. Giving up the habit of self-betrayal in favor deeper trust. Giving it up even if it has won us accolades in the past, has kept us safe, and has provided us all the juicy benefits that come with being the nice-to-have-a-round right hand woman. And being willing to risk losing, in favor of knowing we’ve done our absolute best ensure our voices have been heard. And finally, I believe that the time to begin is now. There has never been a riper movement. There has never been a greater need. Will you join me on this quest? If so, here’s a first step. 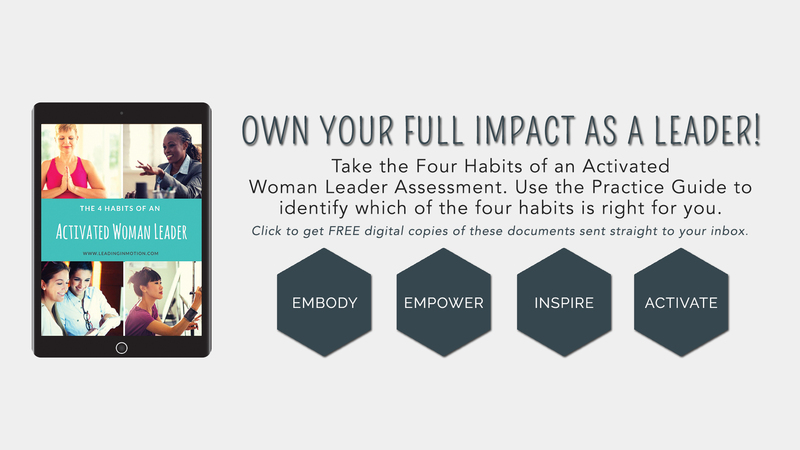 Download this free assessment and tutorial on the 4 Habits of an Activated Women Leader today, and start identifying the most powerful new habits you can build immediately that will increase your leadership impact. It’s my gift to you, in honor of the awesome work you’re already doing in the world. PS – If you have questions, or are looking for more personalized support, please don’t hesitate to get in touch with me at leeann@leadinginmotion.com. PPS – If this article speaks to you, please share! amen. love it. I am with you on this!!! I love this, LeeAnn wise woman! So to-the-point and uniquely voiced. Thank you. And looking forward to more from you.